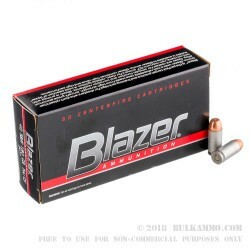 CCI’s Blazer line of ammunition features casings that are made from heat-treated aircraft-grade aluminum. Boasted as offering all the performance of a brass casing but for a lesser price, you may also value this casing for the lighter weight that it imparts on the cartridge -- aluminum only weighs one third as much as brass. 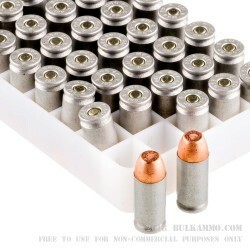 Aluminum may oxidize with age, but it certainly doesn’t rust, so this round’s casing also offers superior corrosion resistance compared to steel, that other budget ammo casing medium. 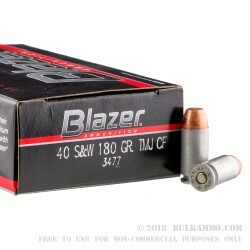 This 40 S&W cartridge by CCI features a 180 grain total metal jacket. 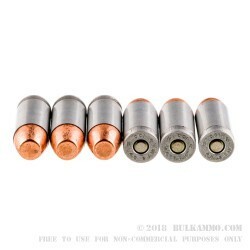 This round is ideal for firing in poorly ventilated indoor ranges, as its bullet’s base is fully shielded against the hot propellant gasses which would have otherwise evaporated it. Breathing in lead fumes may be an unsavory aspect of shooting, but it certainly doesn’t have to be.